Abstract: Tularemia is a zoonosis caused by the infection of Francisella tularensis (a gram-negative aerobic bacterium). Transmission to other animals or humans usually occurs through insect or tick bites, direct contact with a contaminated environment (mud or water), infected animals – mainly lagomorphs – or by ingesting undercooked meat or inhaling contaminated dust (hay or soil). This paper discusses the case of a 32-year-old man, who came to our Emergency Room presenting with persistent fever, inguinal lymphadenopathy, and an ulcer on his left lower limb on a linear morphoea lesion that had been there for some time. 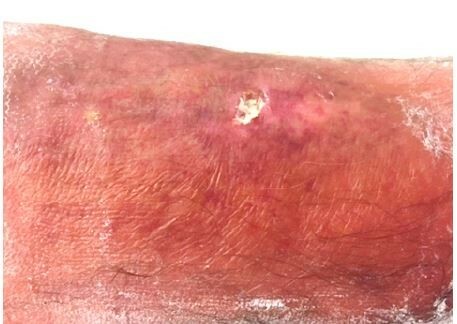 The lesion was surrounded by erysipelas. After hospitalization and tests, the patient was diagnosed with ulceroglandular tularemia. Antibiotic treatment with doxycycline resolved the clinical picture, but not the morphoea lesion.